I look back on my Holy Family Catholic High School experience, and the first things that come to mind are those after-school runs to the local Holiday gas station for a snack before sports practices, or those ice cream stops in downtown Victoria after a baseball game on a warm summer night. My high school experience wouldn’t have been the same without the city of Victoria. It seems Holy Family and Victoria are connected. While the city is quickly growing around Holy Family, the bond between school and community is also growing stronger as the school enters its 19th year. What residents of Victoria are learning is the connection to Holy Family Catholic High School extends year-round. Many students work for surrounding businesses and local restaurants that have become “unofficial” Holy Family gathering spots before or after home games and continue to be favorite stops in summer. And while it’s not documented anywhere, it has often been said Holy Family is one of the largest employers in Victoria. To keep that community feeling going this summer, there are a number of events that connect Holy Family with Victoria. It’s not too late to enjoy more than one of these happenings that will keep you and your family coming Victoria during warm summer months. 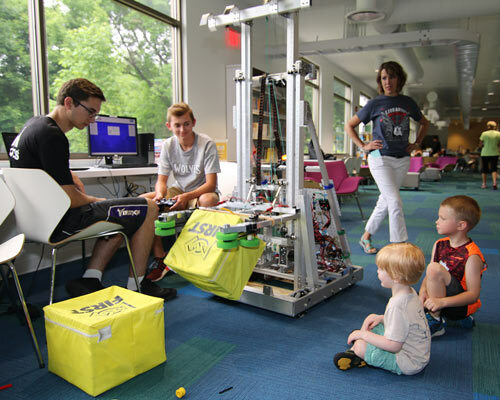 Members of the Holy Family Robotics team visited Victoria and Waconia Libraries In June. 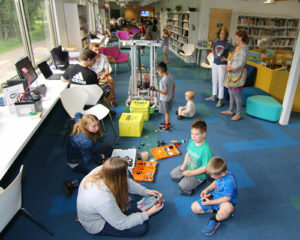 Members of the Fire robotics team demonstrated their skills at the Victoria Library on June 12, just a week after school let out for the summer. Besides demonstrating a competitive robot, team members worked with kids of all ages eager to build cars, trucks and their own creative engineering marvels. Holy Family’s student council maintains County Road 18 between Bavaria Road and Co. Rd 11. Students met June 1 to clean the roadway, and will organize a follow-up cleaning in early November so the Victoria community shines. Students are encouraged to keep the roadway clean all year as there is a posted “Adopt a Highway” sign indicating Holy Family maintains this stretch of road. 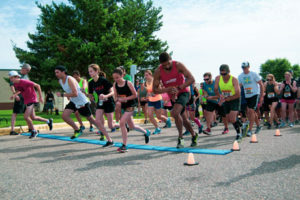 June 23 marked the inaugural “Running on Enki 5K” event, co-sponsored by Holy Family and the hometown Enki Brewing Company. The event also had a purpose—to enrich the lives of students and engage the local community with Holy Family. Missions accomplished! Over 200 runners took part in the first ever Running on Enki 5K including HF staff, alumni, and students. -The event drew more than 200 participants, including many students, alumni and faculty who had a chance to visit and connect during the summer break. -100% of the proceeds support Holy Family’s student activities and the Victoria Lions Park Baseball Field. -Holy Family student Tyler Franck came in second followed by Holy Family Spanish instructor Jorge Oconitrillo. 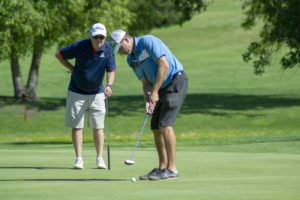 129 golfers participated in this year’s tournament. – Alumni receive special ticket pricing and, for the past several years, have been a part of at least one winning team. – The event is an opportunity for alumni to reconnect with each other, as well as parents and supporters of Holy Family. – Over 30 Holy Family students and parents volunteer at this event each year. During the summer, many Fire baseball players continue to play for the Holy Family Legion baseball team, which plays at Lions Park. These games are a fun way to get outside and enjoy the sun and warmth with your family and friends, and meet community spectators who enjoy the tradition of summer baseball. Once per summer, Holy Family hosts a morning outdoor Mass for the St. Victoria Parish. Mass is set up on the front lawn and guests are invited to fellowship following Mass. This year the Mass is on Friday, August 3. A fun celebration of music and local eats, Volksfest is celebrated every summer in downtown Victoria and is put on by the Victoria Business Association. This summer, Volksfest will be held August 17-18, ending on Saturday with a spectacular fireworks display. Holy Family students volunteer to help set up for the event, supporting one of the city’s biggest events of the year. – Kickoff to Sunset Fest starts with Mass at 5 p.m.
– An all-you-can-eat buffet follows at 6 p.m.
– Entertainment includes the Chmielewski Polka Band. – This year’s event includes an NCAA-style elimination corn-hole tournament with two age divisions—19 and older or 18 and younger. The Holy Family Catholic High School Football team has volunteered to run the first ever tournament.